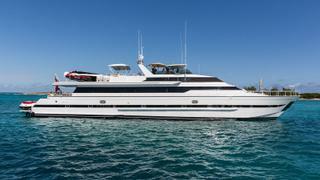 The 31.7 metre motor yacht Illusions has been listed for sale by Jeromy Mold at Worth Avenue Yachts. Built in GRP by Italian yard Versilcraft,Illusions was delivered in 1991 as one of the yard’s Super Challenger series and was fully refitted in 2015. Accommodation is for up to 10 guests in four cabins comprising a master suite, two VIP suites and a twin cabin with two Pullman berths. All cabins aboard this yacht for sale have entertainment centres, satellite television screens and en suite bathroom facilities. The large and long main saloon has a staircase to port which descends to the aft crew cabin and one guest cabin. An entertainment centre is situated to port and forward of the staircase. The entertainment centre is well equipped with a 55 inch Samsung television screen, PlayStation, DVD and Bluetooth accessibility. A comfortable seating area with coffee table is situated opposite to starboard to enjoy the entertainment centre. Moving forward to port there is another comfortable couch with a coffee table and arm chairs. Further forward is a circular dining table with seating for eight to ten guests. On deck, the flybridge is a huge and fun area with different areas for lounging, sunbathing and relaxing. It is entirely carpeted with grey indoor-outdoor carpet. There are full navigation controls and all equipment is repeated from the wheelhouse. Completing the picture of al fresco relaxation is a large gas barbecue grill and wet bar, and a 32 inch waterproof television screen pops up from the bar. Twin 1,100 Detroit Diesel engines allow a cruising speed of 15 knots topping out at 25 knots and she is fitted with Naiad zero speed stabilisers. Lying in Fort Lauderdale, Florida, Illusions is asking $1,800,000.